This post is a very graceful way of me saying, I am having a break. I did think about doing the whole " IS THIS THE END?" DUN DUN DUN, style post but then I thought Nah! Recently my blog analytics haven't been great. Now I could sit here and be like " Oh I don't care about my blog numbers. You can't measure success numerically" And that's so true! Some of the best blogs I follow have a very small following in comparison to some of the bigger bloggers and produce content just as good! However, seeing your blog grow, is such a big kick up the bum to work harder at it. This summer my blog grew exponentially. My posts went from getting under 100 views to, for some now, over 1000! Which is quite frankly insane! The best way I can describe how I feel now is by letting a balloon go, it flying higher and higher and then suddenly BANG! It deflates and falls back down to the ground. This is how I would describe my blog analytics metaphorically at this moment in time. Therefore, I have completely lost my motivation to post and do blog related things! Now if you know me then you will know that I love being organised and have had all my posts ready to go for the month ahead, which is fine. I am not lacking inspiration. I have got loads of good posts that were supposed to be coming up in the next couple of weeks, but I am just not feeling it! It's becoming a chore to read 95% of my bloglovin feed because I have to rush to do every night because of the lack of time I have. I feel pressured to join twitter chats but don't really want to talk to anyone! I hardly use Instagram anymore because all the people I follow and follow me back don't upload anymore. I want to do more fashion style posts but I just simply don't have the time to produce them to the standard I desire. I am getting sick of reading the same posts over and over again. There is only so many times you can buffer a tweet without it looking spammy! I AM JUST GETTING TRIED OF EVERYTHING! And you know what? That's okay! Blogging is a hobby! Just like ballet, football, piano, singing, tightrope walking or juggling are as well! You take breaks, you relax! YOU STOP AND BREATH ONCE IN A WHILE! I love blogging! It has provided me with so much confidence. Which has been especially apparent in starting college where I spend two days a week on work placement, doing real working hours, in a real job setting! I love my course, it's fun and very rewarding but I am writing upwards of 4 to 5 essays a week! I don't mind it, I enjoy writing which has only steamed from blogging so much! So to make sure that I still enjoy all these things that have all come from me enjoying blogging is STILL ENJOY BLOGGING! If that means taking a break! It means taking a break! Don't worry, I am not going to be gone for 8 months or something drastic like that! I am simply going to be having a few weeks of to refresh and forget about blogging for a bit. I will still be reading and commenting on everyone's blogs, because you guys are just fab! I will be active on twitter, tweeting random and unrelated blog things! I am going to unfollow all the people who don't upload on Instagram anymore and I might change my blog design AGAIN as well! I hope you enjoyed this post! And I will see you very soon, bright eyed and bushy tailed! One part of blogging that makes the whole process very enjoyable is receiving comments on your latest post. It makes you feel all warm and fussy inside, like on Christmas evening sat by the fire, in a cosy Primark Christmas jumper and a tin of quality streets by your side. I am going off on a bit of a tandem but you get the picture. However, one thing that no blogger likes to receive is fake comments. 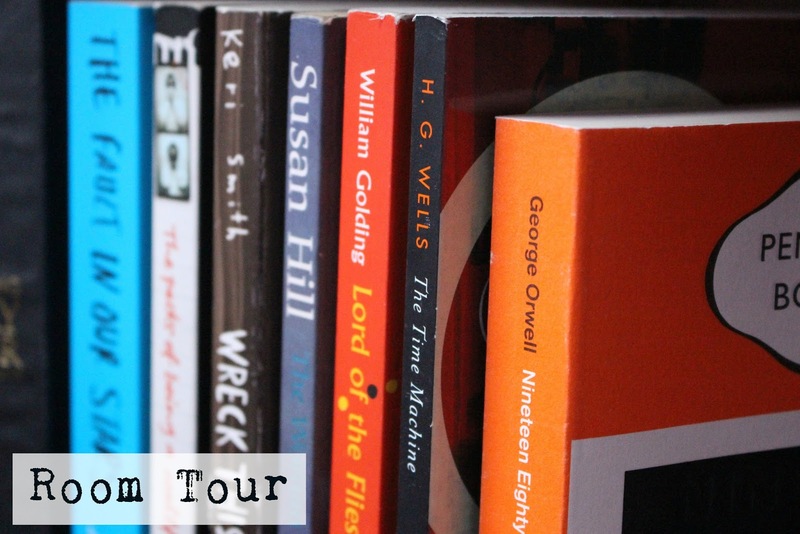 You know the kind: ' Love your blog, will you come and check out mine? Follow for follow? Comment for comment? ' when you know damn right that they have just copied that across 30 blogs. So to avoid this, I am going to give you some advice to get the warm, fuzzy Christmas feeling comments, not the nasty scrooge ones! And lots of them, throughout the post or at the end. I tend to ask my readers specific questions through my post, for example if they want to see a post on a topic, I just mentioned. I always ask some more general questions at the end. This way, it's the last thing they read, so its in their mind. This also works really well for ' skim readers' who may miss a question in the post. By actually interacting with your audience it shows you have an interest in them and are not just some crazy robot, that belongs in an SC-Fi film. If I see a comment that I know someone has not read my post and the comment is pretty much pointless, I simply comment ' Thank you' I chose not to get angry or sassy, because that just isn't the way. Some would delete it or ignore it, which is totally fine but I just can't deal with my comments being on an even number, it drives me up the wall! Anyone else feel my pain? When you are a child, you are told not to rise to bullies and it's the same concept here. To feel part of the blogging community, you must talk and interact with like minded people. 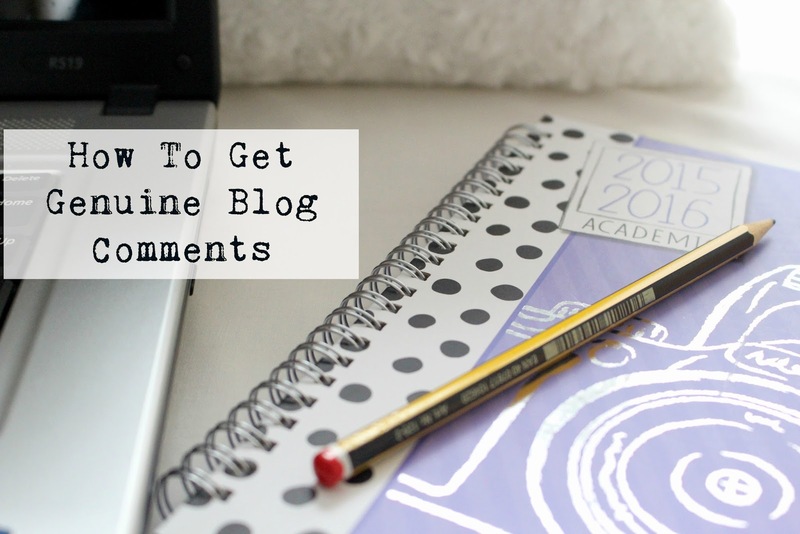 Find others with similar interests and comment on their blogs * Genuine comments, of course, * This way they are more likely to come over to your blog, maybe leave a comment. As more friendships build you will want to comment on each other's posts. This way you will have a good bank of genuine comments! Of course, blogging friendships are about a lot more than just commenting on each others blogs, but you guys know that! Thanks for reading! 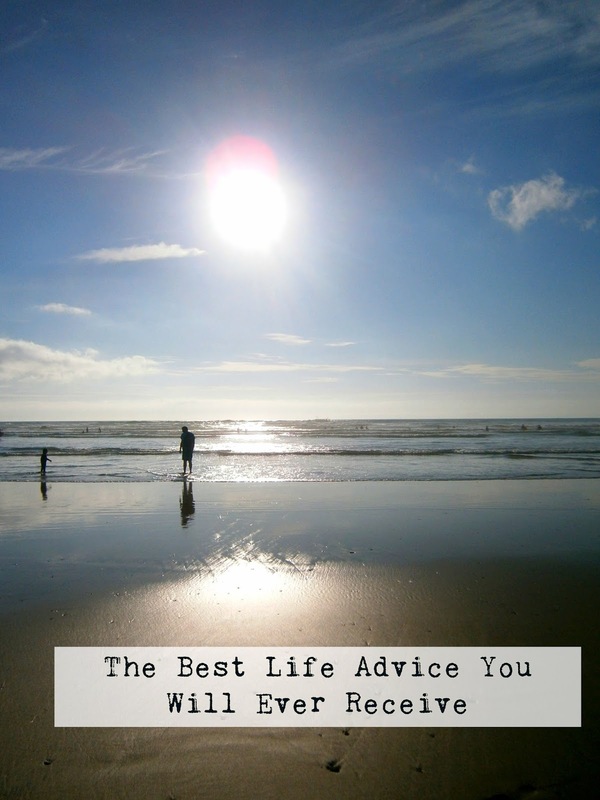 I hope you could pick up some useful advice here! How do you get genuine comments on your blog? How do you deal with spam ones? Let me know in the comments below! Are you new to photography? Want something light and easy to travel with? On a budget? If yes, I recommend a compact point and shoot camera. Do not underestimate the power of a compact camera! Yes, they may be small but boy can these take some good, detailed shots! They are cheaper than most other cameras but don't let that put you off! Canon Ixus 275 20Mp compact digital camera- with 20 megapixels and a optical zoom of 12, this is going to help you capture those perfect shots in high resolution. 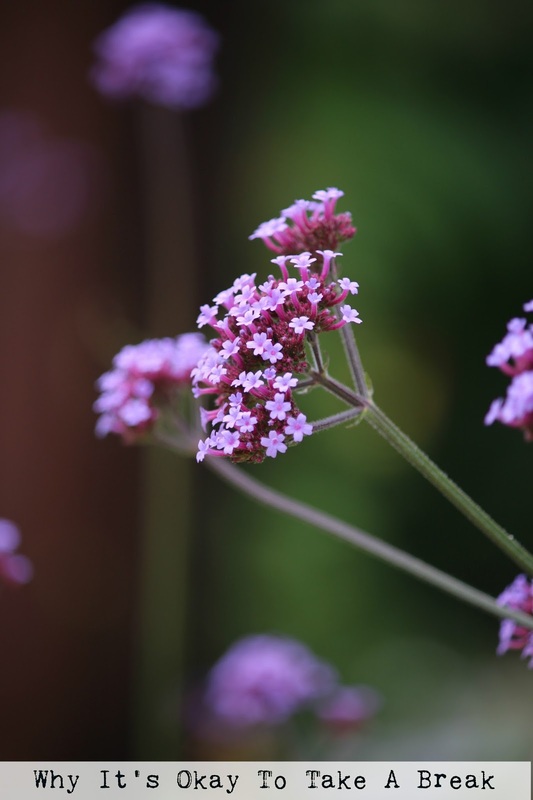 Optical zoom will simply allow you to get closer to the subject without losing quality. For under £150, it's perfect if you are a travel blogger but don't want to risk damaging or losing a couple of thousands of pounds worth of kit. It also has full 1080p HD video quality, to capture any stunning video you want right as it happens. Not new to photography, wanting to upgrade your camera to something better? Don't want to fork out on a DSLR? Then I recommend bridge cameras. 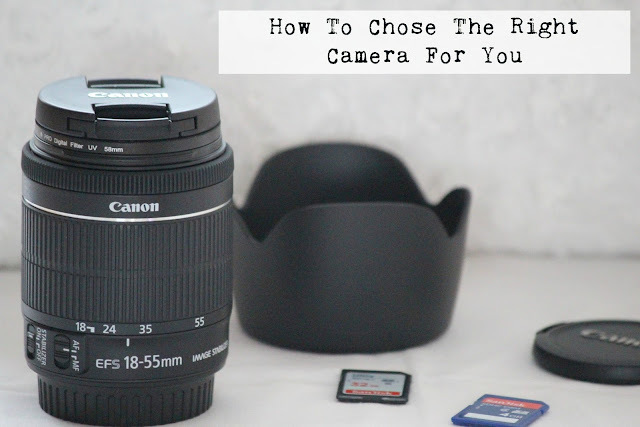 The middle man between compacts and DSLR's depending on the megapixels and optical zoom they can be nearly as good at DSLR's but considerably cheaper. Bulky and heavier than compacts, they may not be as good for travelling but they still are a lot more hassle free than DSLR's. Wanting some high-quality images for your blog or job? Want to start taking photography seriously? Got a little bit more money to spend? I recommend the Cannon Eos 100D. This Is the actual camera that I use to take my photos for my own blog. It's the perfect entry level DSLR. For the body alone it will cost around £360. Obviously you will need lenses on It, but that's a completely different ball game that I will leave for another day. It has fewer megapixels than the bridge camera, having only 18 but by having a better sensor, a bigger ISO range ( 12800-6400), it will allow you to take extremely good quality photos. It also boasts to be the lightest DSLR in the world, this, of course, depends on what lens you put at the end. Thanks for reading! I hope that you are now able to find a suitable camera without worrying you need a £1000 camera and your bank balance won't stretch that far! what camera do you have? Do you have any camera recommendations? Let me know in the comments below! A very long time ago now I sent a DM on Instagram to some of my closest blogging friends and I asked them ' What is the best piece of life advice you have ever received?' and they all got back to me, which was great. Admittedly I completely forgot I even asked them this question and it wasn't till the other day that I realised that I hadn't actually made the blog post, I said I would. So here it is a whole 12 weeks later, their response!
" If you try your best at something then no matter what happens you can be proud and know that you couldn't have done any more, whether that be at school, sport etc. " "Anything is possible if you can dream it you can do it! Never give up on your hopes and dreams. Just have the motivation to continue every step of the way, even if you get knocked down along the way, and soon you will be one step closer and eventually there"
" If at first you don't succeed-try, try again. Never give up"
" Don't worry, there are secret opportunities hidden inside every failure"
" Don't compare yourself to others, ever. why? because individuality is why you are loved and similarity is boring"
" Life isn't about waiting for the storm to pass, it's about learning to dance in the rain"
" I just believe that everything happens for a reason and if you don't get something- it obviously wasn't meant to be"
" Believe in yourself and you are halfway there. A positive mindset works wonders"
" Yeah yeah yeah, that's really nice and all, but what was the point of this post? The idea of this post was to bring some positivity to your day, which sounds really cheesy and something that I don't really do on my blog that often But the thing is, I am the writer, editor and photographer of this blog, I run it all by myself, so you only ever hear my advice, my opinions, my stories etc. Something that I am very aware of is becoming to narcissistic. I don't like to hear my own voice over and over again like a broken record, telling you the same things. Sometimes it's nice to have a breath of fresh air and hear it from a different voice. Thank you to all the girls that were part of this post! I'm sorry it's been so long but you know life gets ahead of you sometimes! What's the best piece of live advice you have ever received? OMG! I KNOW RIGHT, A FASHION POST!? Even though my blog is called 'Thriftyvintagefashion' it is very unlikely that you will ever see fashion posts on here. "Why on earth did you put fashion in your blog name then Nicole?" Don't worry, I am not insane ( well....) I really enjoyed fashion and reading fashion blogs back last year but then I kind of well fell out of love with fashion really, because I thought everything was so similar to each other and boring. But after a lot, inspiration from other bloggers * cough Sophie cough* I decided to do this quick how I style post. I am not saying these are going to be a regular thing, but if you guys like it, I might do another one! I love dungarees. They are simple, effortless and can be really easily styled in lots of different ways, They do make you look about eight years old, but you know- I'm fine with that. 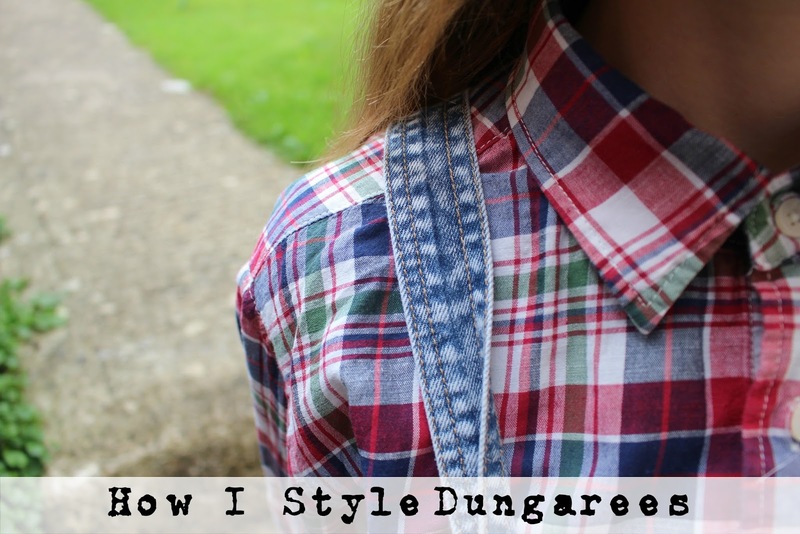 So today I thought I would show you three different outfits I have styled with these dungarees, which were originally from Primark but I got them from a car boot sale for 75p! I love me a nice button up blouse ( I have quite a few) Not only do they look great paired with jeans and skirts but also dungarees. This mint green blouse, with pink and purple flowers on it, was also originally from Primark, but I got it from a car boot sale for a £1, unworn. I definitely feel wearing a shirt under dungarees can make a look more feminine and girly. Who says that stripes and tartan couldn't go together? Probably most people, but I think it looks alright! Underneath the dungarees, I wore a striped t-shirt ( which was originally my mums but she shrunk it, so I kind of nicked it) and my Harrington jacket which was from warrior clothing. I love this jacket, its so comfy and casual and goes with almost anything! Plaid or checks, whatever you want to call it, is one of my favourite patterns to wear. I have gone through so many checked shirts, but my favourite is definitely this one, which was originally from Uniqlo, but I picked up from a car boot, unworn for £1! This is definitely much more of 'tomboy' style outfit, but if the plaid was pink, it could look girly, Plaid shirts are great for layering up with, in the autumn and winter as well! well, that's it! You have probably discovered I have little knowledge of fashion and really don't know how to describe outfits. I did have another outfit but the photos didn't turn out that good, so this is what I was left with, I hoped you liked it anyway! 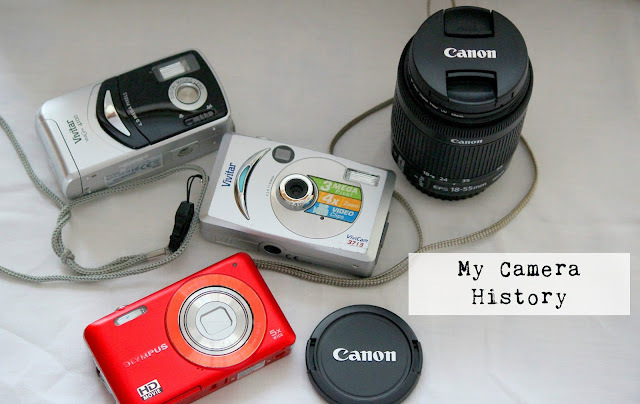 Last week, I discussed my camera history, which if you missed it you can check out HERE. You should know by now that I love my techy stuff and this is also quite apparent through my childhood years. I have loved cameras and all sorts of other gadgets as a child, though it's so strange to think that when I was born and through the early years of my life there was no such thing as YouTube, Facebook, Twitter or Instagram. I am going to sound so sad, but I kind of can't imagine the world without these things as they are now such massive parts of our life's. 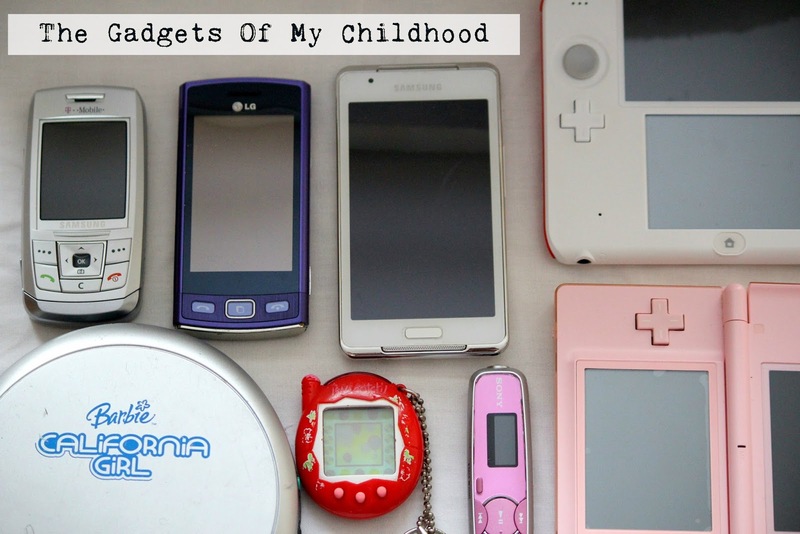 So today I thought I would give you are run down of some of the gadgets I used as I child if you had any of these then YAY for Throwbacks and naff technology! My first mobile phone is actually not in these photos because I think we sold it?! I couldn't imagine who to or we lost it? Anyway it was an NOKIA phone ( surprise, surprise) and it wasn't even brought for me, it was my mums old one she had as a teenager. I was probably given this phone when I was around 7/8 years old. Yeah, screw any three-year-olds with iPhones these days. What has society come to these days? I remember the best feature of this phone was the moving screensavers for birthdays and Christmas that, of course, were all in black and white. The next step up from that, which I probably got when I was around nine ( I didn't have my Nokia for very long- I can't think why?) was the Samsung flip up phone. Now I had two versions of this phone. The silver one, in the photo and a bright a pink one! ( Because yeah whatever, let's have two versions of the same awful phone) I can definitely remember selling the pink one so I was only left with the silver one. As a child, I used to swap these around. Sometimes I would have the pink one and sometimes I would use the silver one, don't ask me why! I was a weird child okay? Now we are getting into exciting stuff... phones with the internet. My next phone, which I got in year 7 or year 8 and had until last year because everyone refused to buy me a new phone even though this one was useless, was my LG bright purple phone, I even think this phone had a weird name, like 'Viewty snap gm360' or something awful very similar. It was touch screen and had a 5-megapixel camera which makes me laugh because I thought that was going to be so good but I now know so much more about cameras nowadays. It had the internet and if I remember correctly it also had some pretty cool games on it! Portable CD players aren't really that portable. Once someone realised that, small Walkman/ MP3 players became a lot more popular. I got this one for my 7-8th birthday. It still does work but is completely battered and smashed, though. I then moved on to my Samsung MP3 player which looks like a phone, does everything like a phone apart from make phone calls, I got this when I was in year 9 after I bought a iPod nano and it completely broke on me, no more than two months later, I was really disappointed as I was really excited to have my first apple product. One of the main reasons today that I don't own anything by apple. The one game system that everyone will remember if they were a child from the mid-2000's is a Tamagotchi. The small little screen with your own little virtual pet, you got to name, feed and play with. I had this when I was around 7/8 to 9/10. It was honestly so much fun. I used to get my mum to look after it for me when I Went to school. I am ashamed to admit that some of my pets did die because I neglected them! Can you believe that they still sell these today in Argos? The DS! I loved my DS growing up as a child. I have had my pink DS, which was the first ever model since 2008, My favourite games were Mario kart and art academy. I remember using the chat, to talk to my friends at sleepovers, because I was that cool! In 2013, I got the new 2DS. I got this because I wanted to play some of the 3DS games but I can't watch 3D. Essentially I didn't play with it much because I started year 10 and there are a lot more important things to be doing than playing animal crossing. And that's it! I hope you enjoyed reading what gadgets I had during my childhood! What gadgets did you have as a child? Was it any of these? Tell me in the comments below! 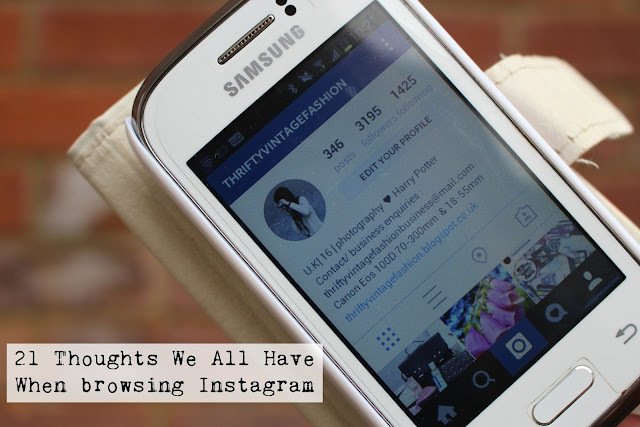 I used to be obsessed with Instagram, now not so much! I kind of feel its getting a bit dull, repetitive and boring. I practically feel like 80% of the accounts that I follow just post the same old stuff as each other. This isn't a rant, by the way though I know I am coming across that way. So I am going to get off my soap box and give you a run down of 21 thoughts that I think and I know you do too, when browsing Instagram! #1 " OMG Yes, New comment! My followers are so kind and caring" * Clicks on new comment* 'F4F' " EURGH!!!!" * Starts banging head against any hard surface I can find* " Don't people understand that 'f4f' thing was so 2012. Move on with your life! #4 #bbloggers #lbloggers #beauty #makeup #life #hashtag #nolife #Ihaverunoutofhastags " How many hashtags is an unexpectable amount again?!" #5 " YES, my latest photo is seriously good quality" * posts and sees it on timeline* " Why Instagram?! Why do you have to completely ruin all the photos that I ever post "
#6 * Sees a stunning holiday photo of some foreign tropical island* * Looks outside at the it completely chucking it down with rain and realises you are snuggling a blanket and a hot water bottle and it's actually the middle of August* " Why the hell do I live in England" SERIOUSLY?! #7 * Scrolls down feed, to see mouth watering snaps of delicious gourmet meals* * Looks down at own plate to see a handful of kids smiley faces and chicken nuggets* " I could totally do that gourmet meal thing! Yeah Totally! " #11 * New product got released this week* " Omg there is that new book by that Youtuber" * scrolls* " Oh look there it is again" " And again" " Oh look and again"
#12 " New competition! I must totally enter that, wait it's going to mess my feed up. When does it run out? Next Monday, okay I will post it an hour or two before it closes" * Next day* DAMMIT! I FORGOT, I'm such a bad human being! " #14 " I love everyone's captions, they are so sassy, I am definitely going to try and do sassy captions" * Tries sassy caption*" Nope my sass attempt failed miserably"
#16 " That Mac lipstick is so pretty!" " Omg that new naked palette is stunning" " I am so going to pick up that new blush!" " Oh yeah, I can't, because I have no money, never mind, back to living of 25p noodles!" #19 " No I don't want a goal helper, No I don't want to be involved in your game and No I don't need a 'minion' Please leave me alone! #20 " OMG, I have a DM, someone actually wants to talk to me" *Will you subscribe to my YouTube? * " NEVER MIND!" #21 * Goes to photos you are tagged in... None! * " Forever Alone!" I hope you guys enjoyed this post, It's something new and different that I don't usually do. Please tell me you can relate to some of these things and it's not just me! Oh God, a room tour! That really popular video on YouTube that everyone loves because it gives you the perfect excuse to be nosy and have a snoop around other people's bedrooms. Which if you ask me, is quite frankly a bit weird. But hey I'm going to do one today in photo format. Enjoy being nosy! On my shelf's I have a big array of things including my pretty big DVD collection. Can you tell like kids cartoons and animations, more than I probably should? And is the very few books that I own, that make me look intellectual. Behind the hair slide, I have a bird cage, one of many. This was from Asda and next to it, is a bottle of perfume that I have has since 2008. No, I won't throw it out because the bottle is too cute but don't worry, I don't use it! At the top of my bed, I have this heart thing also from Primark. Along the top of my bed are these flowers from Sass and Belle. My VW campervan sign that sits above my bed is from the Range! In so many of my Instagram photos, I get asked where my Birdcage is from, it's from Amazon and the clock is from Homebase. If you have been following my blog for a while then you will remember when I made a blog post called ' DIY cassette wall' yeah I never did finish it. My prom dress sits on the back of my door because I have no well else to put it! This is my record player. I am not Tumblr enough to have a Crosby. Wow, my camera really does show up how dusty it is. Along the top of my room, I made a photo line of black and white photos. And yes that is a tarantula. I hope you enjoyed reading. I was very sceptical about doing this post as it's not really my thing and also I really dislike my room though I think I have made it look mildly better than what it looks like in real life. You guys seem to really like Skincare routines, so I thought I would share with you, my current one. It does change quite a lot as I have been trying to step away from my 'simple' product overload and try some new brands. Let's go! 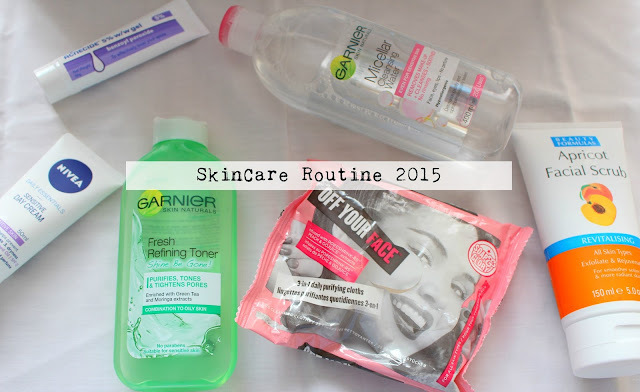 Before I brush my teeth, I like to remove my makeup, cleanse and tone, I use the Garnier Micellar water, just like every other blogger and vlogger to remove my makeup and cleanse my skin.Quick heads up, if you use this product, try buying it from savers and discount beauty shops because it is a lot cheaper than boots or Superdrug. I will then go along, and use the naughty chocolate bar of the skin care world, face wipes. Can you imagine wiping chocolate all over your face though?! EW! Anyway, my current choice is the Soap and Glory 'of your face' wipes. These smell amazing and I don't think I am doing much damage as I use the micellar water alongside it, I just want to make sure that I get every last bit of makeup off! Next I use the Garnier toner. This stuff is really good if you suffer from acne or oily skin, It's an acid based toner with salicylic acid in it, which really helps fight spots and blemishes. It also gives a nice tingly feeling when you are using it, so if you like that sort of thing, I definitely recommend. If I am having a deep clean, I will go in with a facial scrub. This one is from the brand beauty formulas, which you can pick up in savers I think. It's basically a big rip off of the ST Ives one. I tend to use this once a week. After brushing my teeth, I just wash my face with a bog standard soap and flannel. To moisturise my skin I have recently been using the Nivea, day cream. This is quite thick so you really only need the smallest amount. I try to remember to do my neck at this point. Then finally I use the acnecide 5% benzoyl peroxide gel. You can only buy this over the counter from boots. It's quite expensive and at the moment I'm not loving it, so I am going to be trying out some new spot treatments, once this bottle has finished. If you would like to see a post about best acne treatments under £10, do let me know. And that's me done! In theory, I do this morning and night, when actually I only so it at night! opppss..
After a long hard day at college, in the evening nothing feels better than coming home, sitting back and watching some of my favourite YouTubers. I am a big fan of some of the more well known and popular YouTubers such Velvetgh0st, Zoella and Sprinkleofglitter to name a few however nothing beats discovering a smaller YouTuber, that produces just as good or sometimes even better content. 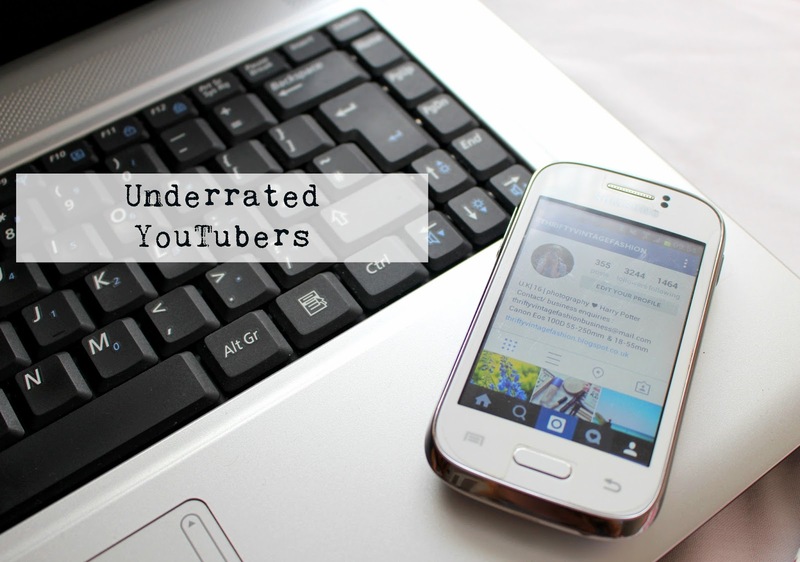 Here are seven underrated YouTubers, that I really recommend you all checkout! Charlotte is an Irish Youtuber and produces mainly lifestyle based content. I discovered her channel through her acne story video which was really inspirational to me as I was suffering from a bad spell of my acne at the time. As well as being able to listen to Charlotte all day because of her Irish accent ( I love a good Irish accent), she's really funny and fun to watch. One of my favourite videos of hers being ' The right to love | Vote yes' where she discussed the very important issue of the contrast between the human rights of heterosexual woman and homosexual men within marriage equality. This video is beautifully produced and shows that not only can she produce fun and light-hearted content but can produce content on more serious and important topics as well. Hannah is one of the funniest Youtubers I watch. she produces mainly beauty and lifestyle content but in every video her bubbly and fun personality shines through. She uploads every Thursday at 5:00 pm ( I know this because I am always really excited when she uploads a new video, Thursdays are just great) My favourite videos of hers are her chatty videos such as her Primark hauls, Q&A's and her room tour! She also recently cut her hair off and donated it to the little princess trust which makes wigs for little girls that don't have any hair due to cancer treatment etc. This is such a brave and commendable thing to do. Kate is one of the sweetest and most delightful people I watch on YouTube. I wish she was my friend in real life because she seems so soft and gentle ( which sounds really weird, I'm sorry) She produces mainly beauty content such as hauls, makeup tutorials and favourite videos. She is a massive fan of Disney like myself. She is also unbelievably pretty and I definitely think she deserves more subscribers for the hard work and effort she puts into her videos. Lauren from Britton loves is one of my favourite bloggers of all time. 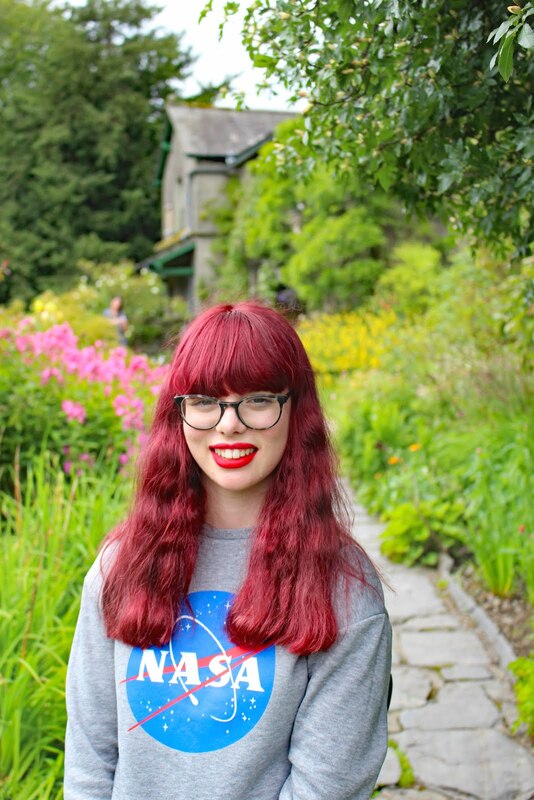 ( You can read her blog HERE) She has recently started up a YouTube channel in conjunction which her blog which is equally as fantastic. She produces lifestyle, fashion, and beauty content every Tuesday at 9 am. The reason I enjoy her videos so much is because she produces such deep and meaningful content. She discusses all sorts of topics, some of my favourites being, ' who are you online?' , ' talking about stress' and ' how I became vegan' She leads a very healthy and positive lifestyle. which is really inspirational as she shares lots of vegan recipes and healthy living tips. She also has a lot of photography tips and tricks on her blog which has helped me massively when I first started blogging! The last and no means least is Robyn. Another fellow blogger which you can check out her blog HERE. Robyn produces mainly fashion based content. She uploads some extraordinary outfit posts on her blog, which I am extremely jealous of because I wish I could take outfit photos like she does. She has only just started up her YouTube channel, but she has some great videos already up including a 'what's in my bag? , ' Hauls' and sunglasses collection. She has an impeccable fashion taste and basically rocks everything she wears! If you are on the hunt for a new fashion blog/ YouTube to follow I would definitely check Robyn out! And that's it! 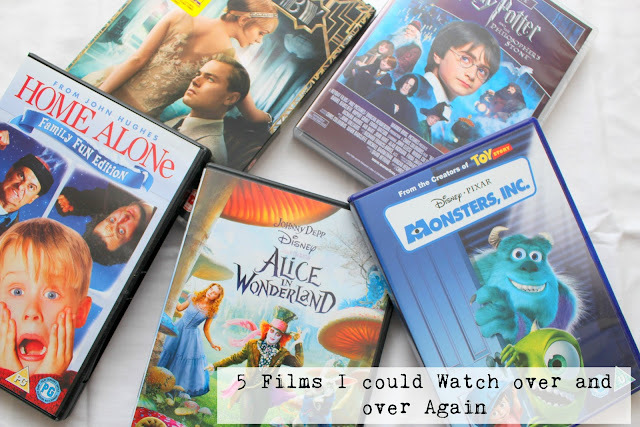 I hope you enjoyed this post and it has given you some inspiration of who to watch next on YouTube. I recently did a deep clean of my bedroom and in the process I was organising all my junk and sorting through and I came across a box of all my old gadgets, that I used as a child. So in true blogger style I thought it would be a great idea to show you. I have a ' gadgets of my childhood post' coming up in the next couple of weeks so stay tuned for that. But as I am a complete photography and camera nerd I thought I would make a separate post all about my cameras that I have used from when I was a child to now! I got a lot of comments on my ' How to take better blog photos' post where people wished they had a DSLR camera to take better photos, but this proves that you have to start from the very bottom and work your way up in the camera world. I hope you enjoy! My First Camera was the Vititar ViviCam 3713. This had a whole, wait for it... 3 mega pixels and 4x Zoom! I know right! It took video clips, which is quite impressive- even though they were probably only 15 seconds long. The main thing that made me laugh about this camera was the tiny view finder. Like seriously what are you going to do with that?! It took two double A batteries and had a flash as well! I can't remember how old I was when I had this camera, probably around 6/7 years old. But now you know if I ever become a world famous professional photographer this is what started it off! This makes me laugh so much, that my second camera was a step up from my first camera. It's the Vititar ( wow I must have loved this brand) Vivicam 4100. I used this until 2012 I think because I can actually remember taking this on holiday to places like Devon and The Isle of Wight. This version still has 4x zoom but now has 4 megapixels!! Let's face it, it isn't that much of a step up from the last one. However, it does have 1.5 inch LED display but it doesn't have a viewfinder, which is probably because they realised it was useless on the last one. To turn on this camera it has a slide function which is pretty sassy and it has the option for macro or landscape settings. You can really tell we are going up in the world of photography now, can't you? My third camera and the camera that I used all the way up to the start of this year was the Olympus VG-120. I got this for Christmas in 2013 I think and I loved it! It's very well used and rightly so. I have taken some really good shots with this camera. It has 14 mega pixels, x5 zoom, a 4.7-23.5mm lens and F numbers in the range from 2.8-6.5. It takes HD movie and had so many different settings for nighttime, fireworks, sunset etc. This camera probably cost less than £100 as well. Point and shoot Cameras these days are really good and you shouldn't underestimate them! Plus it's red, who could not like a bright red camera? Obviously I took the photos above on my DSLR so couldn't take a picture of it! If you do want to see what it looks like I have featured it in posts before. My first DSLR is the Canon EOS 100D. I bought this at the start of July, so I haven't even had it for two months yet! It's an entry-level DSLR but is still an incredible piece of kit. It wasn't cheap but it does come with an 18-55mm kit lens and I bought a 55-250mm zoom lens with it. It has 18 mega pixels and an ISO maximum of 12800, Its so wonderful to hold because it's so light. If you are looking into getting your first DSLR, I would totally recommend this one! I hope you enjoyed this post! I would love to see you guys doing this post, so let me know if you do. I love looking at cameras because I think they are so cool and I am a big tech, nerd ! What was your first camera you bought and what camera do you use now? Sunday, It seems to me that most people hate Sunday because of the depressing and gloomy fact that Monday is right around the corner, ready to greet us with another hard working week at school or work. Though I think that Sunday can be a great day for relaxing and enjoying yourself ( well the best you can) before that Monday rolls around again. So here are 9 ( yes 9, not ten) things to do this Sunday to make it a good one!
" Erugh I don't want to go to a car-boot because you have to get up early and I have to do that tomorrow, I don't want to do it today as well" Yes, okay most car-boots tend to be in the morning but have a google and a scout around online to see if there is any afternoon ones near by. If you are not from the U.K and don't understand what a car-boot is, no its not where people sell parts of cars, its where people clear out their junk and sell it on a table top normally in a field for bargain hunters like myself to buy. Its really fun especially when you snap up a good deal! Not enough people do this in today's culture, ( unless you count Christmas ) Clean away the dust and get them out! Monopoly is an all time favourite of mine. 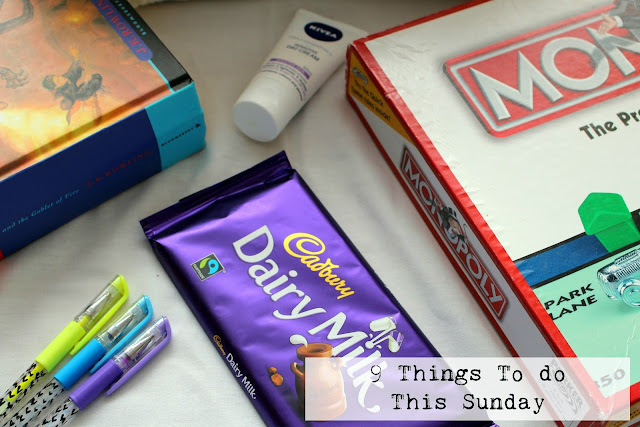 I made a blog post ages ago, called ' the end of the week pamper' but seriously I always like to use my favourite shower gels and scrubs on a Sunday to try and make myself at least a little bit more relaxed. Its also the perfect time to have a bath, if you know you have a stress filled week on the horizon. I would love to say that I only ever eat 'treats' at the weekend, er that's not true, because I am #relatable and I eat them all week long, though I'm not the biggest fan of chocolate so its more just crisps. Sunday is the day that I whip out my weekly planer and I start to see what I have planned for next week and what I need to get done! It's also the perfect excuse to mess around with brightly coloured pens like you are seven. I used to do this all the time from my local library. I always remember it feeling so cool to have this DVD that I didn't actually own. Nowadays we will just watch something that we have pre-recorded or catch-up on Netflix, but its not the same! I find cleaning and re-organising things so therapeutic. It gives me so much pleasure to change around my DVDs or sort out my shoes AGAIN! But even if its not your thing, its still great to get in the habit of doing it. This is a chore in its self. I hate this more than cleaning but having two email addresses that I need to make sure the inboxes are clean, so I don't miss any important emails is challenging so I tend to do this once a week on a Sunday. Also once a month, I like to go through and unsubscribe from the all rubbish I signed up to when I was like 8 years old. Thanks for reading! I hope this gave you some inspiration on what to do this Sunday. I haven't read the book ( I desperately want to though) so I can't compare it to the film but the film as a stand alone film is amazing. The first time I watched this in my English lesson I remember being absolutely hooked, so hooked in fact that I stayed in to watch it over break leaving my friend alone outside ( yes I know I'm a bad friend) The acting, the set and the music is so beautifully done, My favourite scene is definitely the house party or when they they have tea inside because it is raining so they make it look like they are outside! A new favourite of mine, as I only watched it for the first time this summer. Just like the book its probably one of my favourites in the whole series. I love seeing them all as waist high little kids, that wouldn't say boo to a goose. Its so magical to see where it all began. Its such an easy to watch, nothing to difficult to follow film for a lazy Sunday afternoon. My favourite parts are definitely when Draco introduces himself to Harry on the stairs, can you imagine if they shook hands, how the whole series would be so different. I also love their first broomstick/ quidditch lessons. Its a toss up between this film and Nemo being the first film I saw in the cinema ever! I am a massive fan of Disney pixar, a lot more than just Disney ( you can stop sharpening your pitch forks, I'm sorry) Monsters inc is where my love began. I love the characters,Mike Kozlowski being a personal fave. The reason I chose monsters inc over Nemo, is because Nemo can get a little bit boring if you watched it a lot but monsters inc never gets dull! The plot and the jokes are legendary. I am the biggest sucker ever for Christmas films, though I have never watched ELF ( I know shock horror) Home alone is my all time favourite Christmas film simply because of the absolute ridiculous, plot line that makes it just brilliant. Though Home alone is a pure example of when film companies shouldn't keep making sequels and prequels, because lets face it Home alone 2,3 and 4 are absolute rubbish. I hope you enjoyed this quick run down of my top 5 films I could watch again and again. 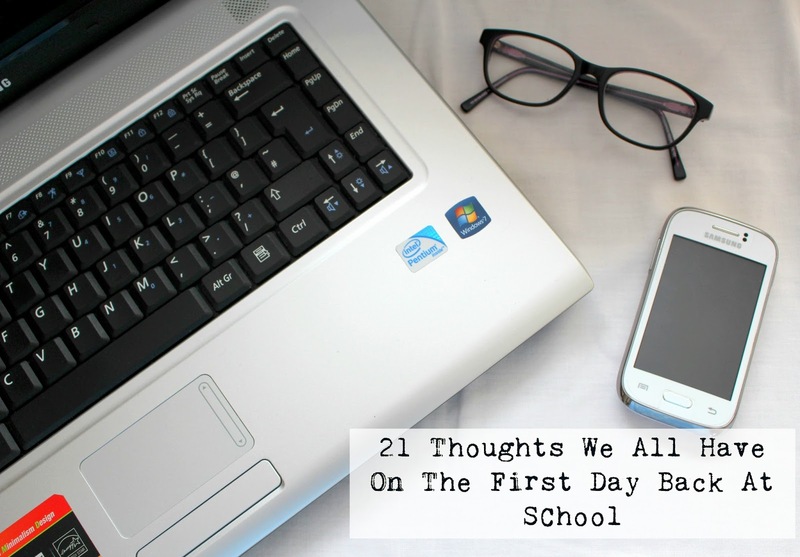 If you are stressed, annoyed or just really sad that you have to go back to school today or later on this week than I have made this fun list of all the things we think on our first day back to school after a long summer break, I hope you enjoy the list and it helps make going back to school this week a lot more bearable. #1 " Okay its 10 o'clock, wheres my food? What do you mean its not lunchtime yet. I had unlimited access to the fridge all summer, I'm hungry!" #2 * I must not have PE today, I must not have PE today. Receives new time table* " OH BLOODY HELL!" " I knew I should of brought of my PE kit. #3 " Its totally against my Human rights to be woken up at this hour!" #4 * Gets on school bus & sees overly enthusiastic year 7's singing and laughing* " SHUT UP FOR CRYING OUT LOUD, its school not a holiday camp"
#6 " If anyone even thinks of touching my new Tippex pen or smelly rubbers, I will personally attach a bomb to the inside of my pencil case- that will show them"
#7 " Stop screaming in your friends face, its only been 6 weeks"
#8 " Why can't my school just be like Hogwarts. Why can't my first lesson be potions instead of Geography?" #9 * Sees everyone else looking really bronzed. "Yep there's me still looking like a vampire"
#11 " I literally feel like an Indian elephant carrying around this bag. Why the hell is it so heavy?" #12 * Stands anxiously waiting to find out the new seating plan. Edges closer and closer next to best friend, hoping and praying you get to sit next to each other!" #13 * Gets 10 minutes in to lesson* " Yeah there is a really good reason why I avoided these morons all summer"
#14 " Wow is that really the date? Sorry I don't normally write the date in the corner of every page in the summer, how would I know what the bloody date is?" #15 " I am going to make sure all my books are kept really neat this year." * Makes a mistake and starts ferociously crossing it out* " Lets forget I ever said that"
#17 " When will I ever need this in real life?!" #18 " Yep this is how I am going to die, DEATH BY BUNSEN BURNER IN A SCIENCE LAB"
#19 " How can they even call this food? I wouldn't even feed this to my dog! Just as well they have vending machines, where I can buy as many 6 pack of Oreo's as I like"
#21 " Is it summer yet?" I hope you enjoyed it, I really enjoyed writing it!